Learn a little about droughts with our “Droughts 101” video. Teachers, scroll down for a quick list of key resources in our Teachers’ Toolkit, including today’s quick-and-easy MapMaker Interactive map of Zimbabwe’s national parks. 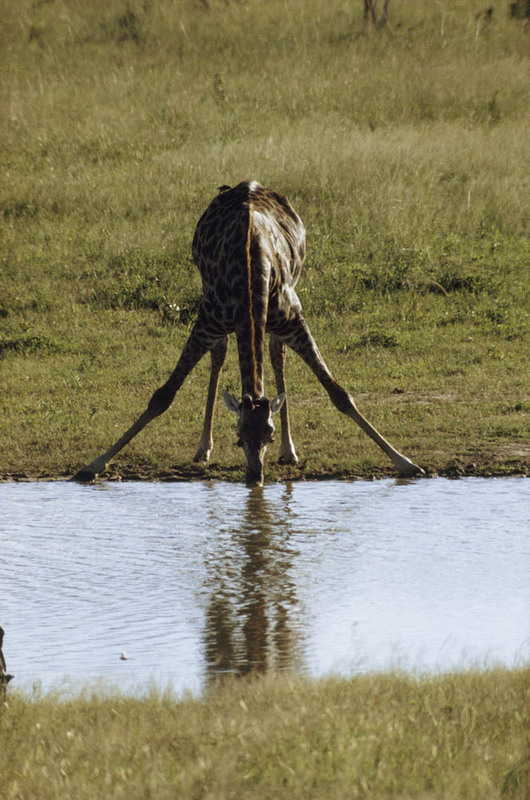 This beautiful giraffe will have to stretch even further for freshwater at Wankie National Park amid southern Africa’s devastating drought. Photograph by Volkmar K. Wentzel, National Geographic. Cecil the lion, killed by an American hunter last year, was probably Zimbabwe’s most famous feline. If the drought continues, Zimbabwe’s national parks may be forced to cull 200 lions. Another big cat threatened by Zimbabwe’s drought is the cheetah. The caracal is a medium-size cat found throughout Zimbabwe and the rest of southern Africa. Elephants put the charismatic in charismatic megafauna. A devastating drought is forcing Zimbabwe’s national parks to sell their priceless, emblematic wildlife, including buffalo, elephants, leopards, lions and rhinos. What weather phenomenon has contributed to southern Africa’s drought? El Niño, a climate pattern that describes the unusual warming of surface waters in the eastern tropical Pacific Ocean, has also contributed to reduced rainfall across southern Africa. Where are Zimbabwe’s national parks? How are they impacted by climate and precipitation patterns? Where are the country’s big cat populations? Use today’s MapMaker Interactive map to find out. Why are national parks being particularly hard-hit by the drought? Some national parks, including the enormous Hwange National Park, have no sources of freshwater outside precipitation—no lakes, no rivers. Zimbabwe’s troubled government allots little funding to national parks. In addition, as the drought continues to plague the region, the government is prioritizing funding food security for its human population. Zimbabwe’s largest trading partners, South Africa and China, are experiencing economic downturns of their own and cannot be relied upon to support Zimbabwe’s national parks. What will happen to the animals in Zimbabwe’s national parks if buyers are not found? “Destocking” the parks may include culling the game as well as selling it. For instance, “the Bubye Conservancy could be forced to cull, or selectively kill, 200 lions due to overpopulation.” Lion populations in Bubye have grown as hunters have stayed away following the international furor over the killing of Cecil the Lion last year. Why are some wildlife conservationists critical of Zimbabwe’s plan to sell animals? Last year, under similar economic pressure, Zimbabwe sold 60 elephants to China for between $40,000 and $60,000 each. China is the leading market for elephant ivory, and conservationists were concerned the animals would be slaughtered.